Cumulative degree-days are an index of the thermal energy experienced by organisms over a given period of time (Venturelli et al. 2010). Spatial and temporal variation in CDD is useful for explaining differences in development, growth, habitat suitability, and assemblage structure of fishes (Venturelli et al. 2010; Wehrly et al. 2012a; Hansen et al. 2017). CDD was calculated as the sum of mean daily epilimnetic water temperatures during ice free days (above a base of 0°C) from January 1 through December 31 and averaged from 2006 to 2012 to capture a range of variation in annual temperatures. In the nearshore and offshore zones (> 5 m), modeled vertical water temperature was used to calculate a mean daily temperature for the depth range of 0-20 m, representing average epilimnetic temperatures (http://www.glerl.noaa.gov/res/glcfs/). In shallow nearshore zones (< 5 m), where modeled temperatures are relatively coarse grained, mean average water temperature was calculated from surface water satellite estimates (http://coastwatch.glerl.noaa.gov/). The resultant CDD estimates from the shallow nearshore, the deep nearshore, and offshore zones were combined into a composite data layer. We classified CDD into low, moderate, and high categories. Wehrly et al . (2012a) studied over 200 inland lakes in Michigan, U.S., and reported that lakes having high degree days were dominated by warm water fishes while lakes having moderate degree days were dominated by cool and coldwater fishes. We used a threshold of 3,900 degree days to delimit the break between medium and high categories (Wehrly et al. 2012a). 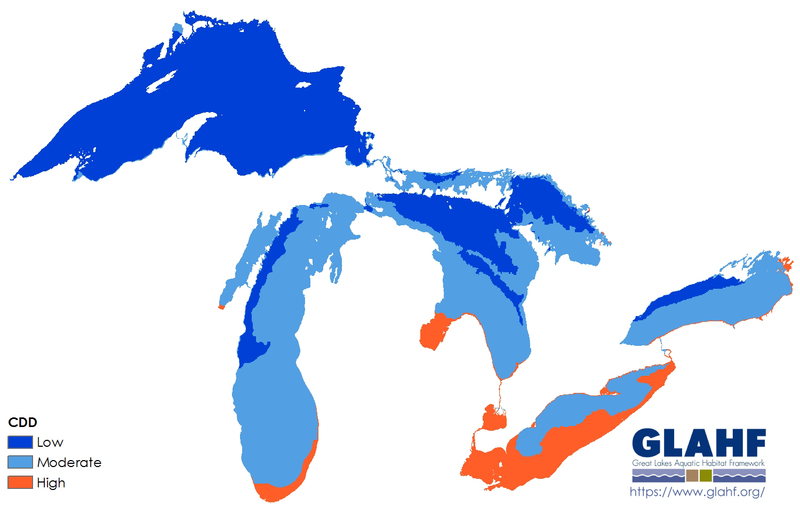 The CDD in Michigan inland lakes do not span 303 the lower range of CDD observed in the Great Lakes. To identify a lower threshold, we overlaid cool and cold water fish distribution maps (Bailey et al. 2004) on a map of CDD and identified a substantial shift to predominately cold water fishes at 3,000 degree days.